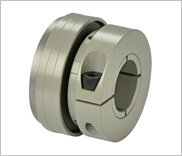 SYNTEX®-NC is a backlash-free safety clutch with a low weight and mass moment of inertia. Large bore diameters and a clamping ring design easy to assemble are further characteristics of the safety clutch having extremely compact dimensions. The design is based on a backlash-free, positive locking ball-ratching principle allowing for a high repeating accuracy and short reaction times during the overall service life. Main applications are state-of-the-art machine tools, control and positioning technology and special purpose machinery.